Keep in mind that if you're a technophile and want to get the most out of CUE, you should get one of the Premium or Platinum models as they include the enhanced audio system as well as full navigation capability. The 2013 Cadillac XTS is everything a big comfort-oriented luxury sedan should be--plus a lot more, for the safety- and tech-focused. Over the past several years Cadillac has made some memorable sedans--especially the CTS and CTS-V models, which are bolder and brasher than about any other sport sedans on the market. The trouble is, that overly edgy style hasn't exactly resonated with the heart of the luxury market. The CTS (and the adrenalizing CTS-V) might go a long way for Cadillac’s image, but there are a lot more Cadillac shoppers wearing their Fratelli Rossettis (okay…or just rocking the Hush Puppies) than flaunting their Pilotis. To help Cadillac set its controls for the heart of the luxury market--"large luxury," as they put it--there's the softer, smoother 2013 Cadillac XTS. It’s a good-looking car on the outside, and while the boxed-out front and rear appearance give the XTS a distinct look, you can see some resemblance to the related Buick LaCrosse in the profile and softly arched roofline (it’s also related to the upcoming 2014 Chevrolet Impala). Cadillac would probably rather have you look from the inside out, as the XTS’s instrument panel and interior trims look like those of no other GM vehicle; there’s a swoopier look and softer details throughout. We're impressed by the combination of smooth contouring inside, contrasting with beveled, metallic trim pieces, all fitting tightly. At the center of the XTS's instrument panel is a reminder of this sedan's leading-edge feature set: an eight-inch, fully capacitive touch screen—like what's used in iPads and other tablets, and the first of its kind to be integrated into a new car. The system comes standard, cleaning up the dashboard and leaving it remarkably free of physical buttons; and in many XTS models there are no real gauges either—just a reconfigurable 'screen' of simulated ones. Cadillac is quick to point out that the 2013 Cadillac XTS isn't trying to be a finely honed sport sedan. But taking that more comfort-oriented mission into consideration, the XTS ends up feeling surprisingly athletic. The XTS's 304-hp, 3.6-liter V-6 moves it plenty quick, with a responsive six-speed automatic transmission, and it can get to 60 mph in less than seven seconds. And in cornering you don't feel the 4,000-plus-pound curb weight so much; thanks to a well-tuned suspension, with MagneRide magnetic ride control and air springs, the XTS stays composed and isolated, keeping minor harshness out while responses are more crisp than in other comfort-oriented cars. MagneRide rather magically cleans up the ride quality, while the active noise control (included in all XTS models, too) counters road noise, so with the XTS's additional noise insulation, it's very quiet inside. And if passenger space is the priority, you've come to the right place in considering the XTS; in back-seat space in particular, it's roomier than most other sedans this size, with plenty of headroom and lots of legroom. Front seats allow plenty of space, too, though they could be a bit more supportive. 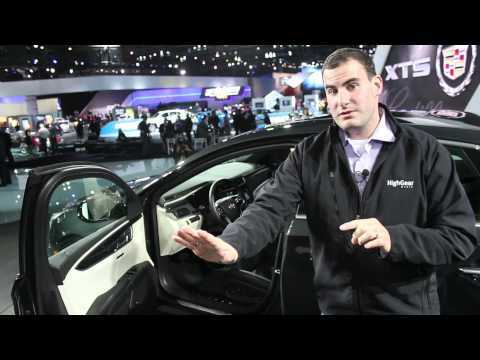 If you opt for either of the safety-tech packages in the 2013 XTS, you'll get one of the most extensive lists of safety features in any vehicle, at any price--including, later this year, a system that can brake the XTS to a stop from about 20 mph--to help reduce pedestrian accidents, for instance. The XTS comes in standard guise, plus in Luxury Collection, Premium Collection, and Platinum Collection versions. All come with CUE, although only the top two models include navigation and premium audio--which help make the most of the system, which also has one of the best voice-recognition interfaces we've ever tested. The 2013 Cadillac XTS won't turn a lot of heads, but the contrast between soft contours and bold detailing make the interior a standout. Cadillac's very bold and brash Art & Science design theme, which has appeared throughout the Cadillac lineup over the past several years, is perhaps at its chunkiest, most aggressive, and most polarizing in the CTS sport sedans. It's carved out a new design direction for the Cadillac, but with the XTS, the brand is taking a smoother, softer direction in going after comfort- and technology-oriented luxury shoppers. So it’s certainly no mistake that the XTS takes a step back. It’s a good-looking car on the outside, and while the boxed-out front and rear appearance give the XTS a distinct look, you can see some resemblance to the Buick LaCrosse in the profile and softly arched roofline (it’s also related to the upcoming 2014 Chevrolet Impala). One of the key differentiating factors between the Premium and Platinum models, from the front, is that Platinum models have a completely metallic grille, whereas Premium models are blacked out in between for a more contrasted look. Inside, the XTS’s instrument panel and interior trims look like those of no other GM vehicle; they quite closely follow the look of the XTS Platinum Concept (first shown at the 2010 Detroit auto show). It has elements of the Art & Science themes that have now been seen in Cadillacs for years, but there’s a swoopier look and softer details throughout. We're impressed by the combination of smooth contouring inside, contrasting with beveled, metallic trim pieces, all fitting tightly. Compared to other large luxury sedans that proritize comfort over performance, the XTS feels nimble, if not downright athletic. Cadillac is quick to point out that the 2013 Cadillac XTS isn't trying to be a finely honed sport sedan. But taking that more comfort-oriented mission into consideration, the XTS ends up feeling surprisingly athletic. A 304-hp version of GM’s 3.6-liter V-6 is under the hood of all XTS models, and power is delivered through a six-speed automatic transmission, with either front- or all-wheel drive. The engine starts with nary a shudder and settles to a smooth idle. And overall, the six-speed automatic transmission does a great job in Drive, in keeping the revs up when they’re needed and bringing them down when they’re not. The engine doesn't churn out as much low-rpm torque as some rival V-6 engines, but it does enable 0-60 mph in just 6.8 seconds and a (limited) top speed of 136 mph. Front-wheel-drive cars weigh about 4,000 pounds, while all-wheel-drive models weigh 200 pounds more than that. You do tend to feel that weight more than a little bit when taking off from a standing start—about the only time that the V-6 seems to labor a bit, until it gathers revs—and when braking hard, with some noticeable nosedive (even though it’s in theory curbed a bit by the HyperStrut design). 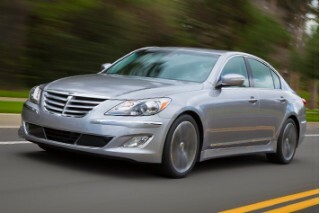 Throttle tip-in—perhaps in a nod to a more hesitant target driver here—is more aggressive than that of the CTS. Where you don’t feel the weight nearly as much (surprisingly, considering the XTS's size) is in cornering. The XTS doesn't throw its weight around; it loads and unloads in a confident way, and stays surprisingly flat. More importantly, it rarely feels flustered, with MagneRide helping with that impression, soaking up road noise and minor harshness. There are two wheel sizes (19- and 20-inch)—and the differences between them, from behind the wheel, really is minimal. A supremely roomy back seat; leading-edge tech that keeps the ride smooth and quiet; and standout materials all assure a true luxury-car experience. At more than 200 inches long, with a wheelbase of nearly 112 inches, the 2013 Cadillac XTS is a large car, slotting alongside standard-wheelbase versions of the Audi A8 and BMW 7-Series, along with the Lincoln MKS, in length. So if passenger space is one of your top priorities, you've come to the right place in considering the XTS. Compared to most of those cars, the LaCrosse's secret weapon is its back seat. There’s truly enough space to fit any passenger in comfort. The headliner includes carved-out areas for even more headroom behind the sunroof housing, so even those well over six feet tall will have extra space. Back seats aren’t quite as contoured as we expected them to be, although the middle backseat position—either more confined, too narrow, or thinly padded in many larger sedans, even—is quite useful here. In front, it's good but not the standout that the back-seat area is. You tend to sit a bit higher in the XTS than in other large luxury cars—which means that you get great outward visibility. Front seats are quite comfortable, but not in the realm of the carved-out, ultra-supportive perches you get in some performance sedans. The MagneRide suspension system, which uses electromagnetically adjustable dampers, can quickly adjust for varied road harshness, and it helps make the XTS feel more nimble without being any less comfortable. MagneRide works together with a leveling air suspension to stay composed, even when you have the whole family loaded in; and active noise cancellation, which helps cancel out road noise especially, is standard. From inside the vehicle, you only hear the engine when pressing it hard—in the range of 4,000 rpm on up—so when you’re just commuting or cruising it’s way in the background. Interior materials are impressive in the 2013 XTS, and definitely a step up from those in the XTS; they include real wood trim, available soft Opus leather with perforated inserts (Platinum). There's also a leather-wrapped instrument panel, and soft-touch surfaces virtually everywhere, while Platinum models also get an Alcantara (faux-suede) headliner. From a controls and ergonomics standpoint, some users may be puzzled to find there are no physical buttons for the climate control or audio (other than what's on the steering wheel). Instead occupants must touch capacitive patches just above tabbed (ridged) areas. We found that these 'buttons' don't always work consistently, or as well as the real thing, however, in a first drive. 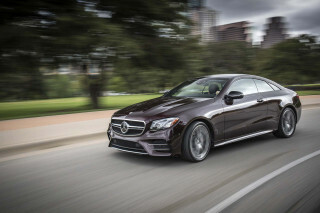 With a suite of new active-safety features and top crash-test ratings, there are few luxury cars offering this level of security. The 2013 Cadillac XTS is an all-new model; but it does build on the already proven Epsilon structure of the Buick LaCrosse sedan--a model that's been given the highest ratings from both the Insurance Institute for Highway Safety and the federal government. While we can't guarantee that the XTS will achieve the same ratings, it's likely. And if you opt for either the Driver Awareness Package or the all-new Driver Assist Package--which includes many GM firsts--you'll get one of the most extensive lists of safety features in any vehicle, at any price. 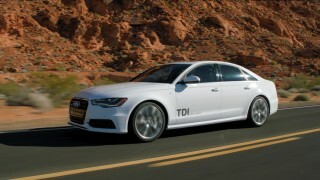 With the Driver Awareness Package, you get Lane Departure Warning, Forward Collision Alert, Side Blind Zone Alert, Rear Cross Traffic Alert, and a reflected LED display, along with a Safety Alert Seat that vibrates on one side or both to help point out potential dangers--like when you veer over the lane marking, for instance. And later this model year, with the availability of a Driver Assist Package, the XTS will offer Adaptive Cruise Control, Automatic Collision Preparation, and Front and Rear Automatic Brake features that can actually bring the car to a stop when moving at low speeds of 20 mph or less. At higher speeds, the feature will also reduce the severity of the impact by starting to brake. Full-speed adaptive cruise control, as well as a Head-Up display are among other safety-oriented options, and a rearview camera system is standard on all but the base model. OnStar Directions and Connections features are included, too, as is Stolen Vehicle Assistance. 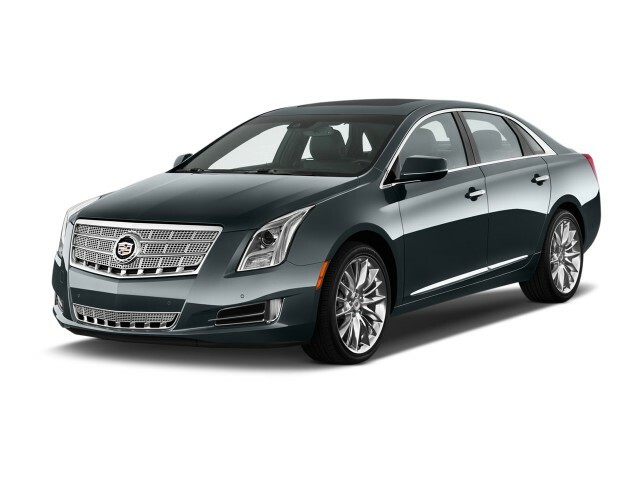 Even in its most affordable Premium trim, the 2013 XTS has a robust feature set—headlined by the groundbreaking CUE infotainment system. The 2013 XTS starts at $44,995 (including destination), and goes to $61,305 for the Platinum (with a $2,000 charge for all-wheel drive). 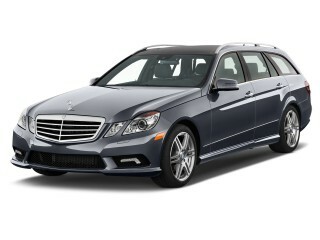 That's about in line with the Audi A6 and Mercedes-Benz E 350. And if you don't mind that the XTS doesn't quite match the pedigree of those German luxury sedans, the features you get for the money are actually a bit stronger. The XTS comes in standard guise, plus in Luxury Collection, Premium Collection, and Platinum Collection versions. All models include a Bose eight-speaker sound system, power front seats, power-adjustable steering, remote start, a universal garage-door opener, and dual-zone climate control. 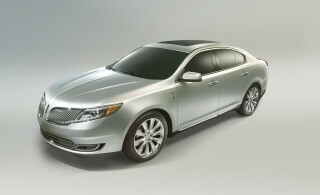 All models include CUE, the all-new capacitive touch-screen system that has many industry firsts. It's the first use of a capacitive touch screen as original equipment in a car, and it's the first use of proximity and gestural sensing, which allows the system to show more menu options only as your hand approaches. There's also a big reconfigurable gauge cluster, which offers several layouts plus lots of customization, that's included only in Premium and Platinum models. So is the much-improved Head-Up Display, which projects critical information onto the windshield; premium sound; and navigation functionality for CUE. So if you want to take advantage of the technology, you'll want one of those two top models. As for CUE, it's one of the most attractive, most intuitively laid-out interfaces yet, but it's not without its little issues. We appreciated how the system has a depth of customization possibilities once you get into the submenus, yet on the surface it simplifies the choices. You can simply say things like “Take me to Starbucks,” or “Let's go to Starbucks,” and it's not so dependent on hitting specific command-tree words. Also, screen scrolling is smooth and glitch-free, and the live-traffic features that have been cause for frustration in so many other vehicles seemed to work flawlessly here, with better detail than most other systems present. Individual options are quite limited in the XTS. 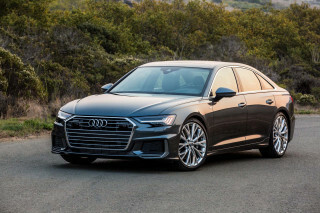 In addition to the Driver Awareness Package (a new set of active-safety features), available features include embedded navigation (for the Base model), an Ultraview sunroof, a compact spare, and an engine block heater. The 2013 Cadillac XTS doesn't have fuel economy numbers that will wow in any way; but considering all the passenger space, they're quite respectable. The 2013 Cadillac XTS is a very large sedan. And with its 3.6-liter V-6 and 4,000-pound curb weight, you can't do all that much to change the laws of physics. EPA fuel economy numbers, though still tentative at the time of posting, are an estimated 17 mpg city, 28 highway with front-wheel drive, or 17/27 with AWD; but considering its true five-passenger capacity--even for long road trips--that's quite respectable. just what I expected of a CADDY! Great car but have always had some issues with the driver memory settings being very inconsistent with the driver seat and steering wheel positioning. Looking for a different year of the Cadillac XTS?